Magic radar is dead, long live the feature-creep! As a part of the Jets DLC 'platform upgrade' (ie the free features available to everyone that owns Arma 3), we're releasing an early, rough version of our revisited take on electronic warfare. Part of Arma that was admittedly experiencing some red chains and needed a buff. With the upcoming Jets DLC (and thanks to your feedback) we now have a chance to overhaul big chunks of the target detection and tracking mechanics. Let's split it into three parts: mechanics, UI and assets. The separation of various sensor types and unification of configuration. Sensors can detect targets by Infra-red or Visible spectrum, by active radar or passive radar detection (RWR), by Laser or NV spots and there also can be a sensor for tracking small targets like individual soldiers. Common properties are ranges, angles, how well the sensors detect targets against ground or sky background, how high the target needs to be or how fast it needs to move to be detected. Targets can now vary in their signatures too. Terrain, route planning, vehicle selection, careful radar usage now makes a big difference. More details about this will be soon available on wiki, in samples, and via an OPREP. The same system can be used for both missile seekers (ammo sensors) and vehicles. So far, we've configured only part of our vehicle ORBAT. The old magical radar slash compass* slash RWR is gone. It has been replaced by a brand-new synthetic Sensor Display (or Tactical Awareness or Tactical Situation Display if you wish). Yes, it's in the UI. Again, no nice display on modelled MFDs. But no unicorns either. It falls under another novelty - the Custom Info - where you'll find how to open and switch to the Sensor Display. * Lack of compass means no functionality for relative turrets' directions. We'll bring it back via other means ASAP. ** The target type on Sensor display allowed us to remove the name tag from mark and lock symbols in 3D. Together with it - and this has a major gameplay impact - is gone the automatic red coloring of enemies. Balancing - it's rough and quite random atm. A big one where we need your playtesting and feedback. We won't push it into Main Branch anytime soon - expect at least 2 months of public testing and balancing. Enemy confirmation - you've probably noticed the enemy symbology. That's for confirmed enemies only. What's that? We plan to add scripts that you could utilize to have entities confirmed as enemies by any way you find useful. Symbology - something we're still uncertain about. Would you like the old squares vs. triangles better? Internal tests show us that the one available now in Dev Branch may be quite unintuitive. We need your feedback here. 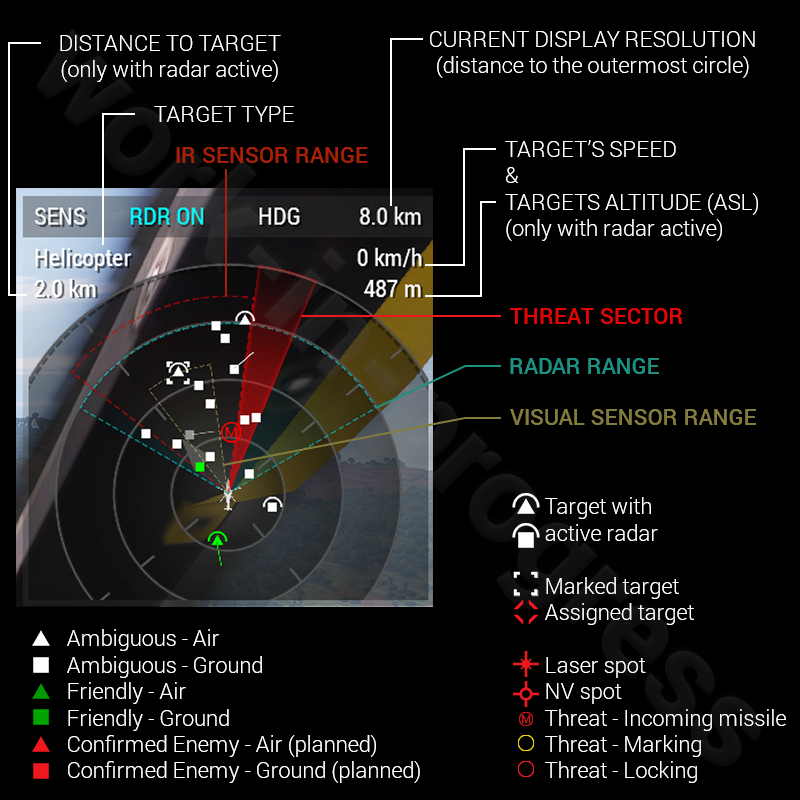 Target Recognition - currently the sensor recognizes the target almost immediately. We had ideas about delays or variable recognition distances based on the sensor. Kudos to our modders and community for feedback, shared knowledge and endless inspiration (heya, mando missile :)) And one special nod to airwarriors.com. It's all I wanted from the Jet DLC! Gonna need a few hours of testing before I can post some valuable feedback. Arma was always great because of its complexity. I welcome this new effort ! In regards to symbology I don't think there is an easy way to just know it from glancing. You gotta learn it as everything else - like keybinds. wow. that looks very, very good! you guys are great! it's even a little more sophisticated than i hoped, but should still be accesible enough for more casual players to have fun with. i think the atomatic TV/IR sensors are a good idea and a good compromise between realism and gameplay. Do the IR sensors actually lock on IR signatures, or only onto actual vehicles? ACE3 has a nifty feature where you can lock the Javelin and the like onto buildings and the like, which are not considered vehicles by the game, but still have a distinct IR signature. Similarly, it would be great if the TV sensor actually locked onto visual contrast, thus allowing camouflage to protect from it (this is why TV sensors are of somewhat limited utility). I really like the new radar system. Detailed, realistic, yet quite intuitive to use. The combined display is not the way these things are usually done, but I think that those features can be expanded upon on a per-vehicle basis (translation: I want separate RWR, IR and radar displays on the cockpit MFDs :)). well, radar tracking should already be possible with this implementation, as the RWR is integrated in the sensor array. i think jamming doesn't make too much sense, with an implementation like this, which is somewhat realistic, yet quite abstract. from my understanding it should however be possible to simulate stealth technology by tweaking the detection range of a given asset. This is great. Any word on missile guidance depending on the aircraft active/passive systems and the weapon's sensors? Mando Missile here we come! > Any word on missile guidance depending on the aircraft active/passive systems and the weapon's sensors? Ammo will use the same system. Are proper SARH missiles going to be possible? Those are guided by the aircraft's radar until they get within their own radar range of the target, at which point they switch to their on-board radar. Am also interested in the passive aspect of weapon locking. What happens when an aircraft locks on to a target detected with the passive radar sensor (RWR) and the target switches radar off? Does the missile continue to track the vehicle if it moves from the position where the radar went dead,does it fly to the last known position, or simply stop altering its heading? Guess I'd need to test with someone in MP. Note that "locking" is technically not possible with RWR, as it involves directing your active radar to track a target (originally, it "locked" the antenna so that it followed it instead of scanning). You could designate a target detected with RWR, like you would with the HARM missile, for example. However, unless the missile is explicitly anti-radiation (and thus uses a system similar to RWR for tracking) or command-guided from the launch platform (rare except as SARH), it won't lose lock just because you lost the radar track, as it's own seeker should be able to see the target and track it just fine with whatever method it uses. Mind that while the target won't be aware of the launcher, it'll most certainly be aware of the incoming missile. In short, this isn't a real concern as far as vanilla A3 is concerned, as it doesn't really have any command-guided nor anti-radar missiles (not that I'd be against introducing both types). The AMRAAM standin can be SARH (which is why I asked about it), but ranges in ArmA are a bit short for that anyway. Besides, AMRAAM in particular needs an active radar lock from the launcher. As of now my only suggestion would be ability to turn off the targeted vehicle name that currently appears next to the target box/indicator/icon. You can't turn it off as of now, even disabling tags does not get rid of it. It gives away "spoilers" when you know you locked on exactly onto enemy assistant machine gunner or something else. Also recognition should not be magical. Would be great if instead of vehicle model, name and pilot shoe size we would get something like Helicopter, aircraft, Armored vehicle. Not sure how you would balance this though, maybe if the detection was done beyond visual range? - Target specifics, to better identify threats. For example, a ZSU or BUK are both equipped with radar so they'll both show up on this RWR, but while a ZSU can be approached to less than 3km, a BUK will shoot down its target at more than 8. 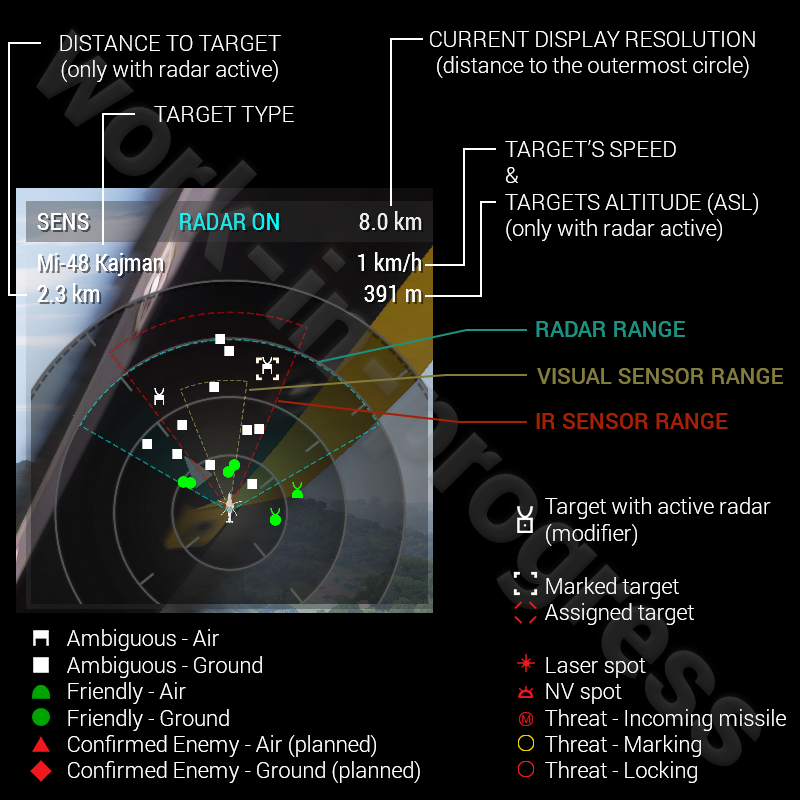 Radar type can easily be identified using simple symbolics, like ZU for Tigris, CH for Cheetah, etc... and will allow the pilot to prioritize targets (which is a lot more useful for SEAD missions). A simple resolution to this issue would be to use a default icon per vehicle class if undefined, but if a custom icon is defined, use it instead, and use color to identify if it's friendly, ambiguous or enemy. Not too complicated programming-wise (I hope), but it would help to simulate a real RWR. - Range specifics, current weapon max, min, eff range in real time according to the target. It would definitely help for BVR to know your weapons characteristics a bit better, especially when coming from far away and to know when best to fire. It adds up a little spice, because it is always best to fire at efficient range instead of max, but it also exposes the platform to enemy fire. - Scan specifics. Currently, it looks like the sensor scans everything at once (which is good for phase array radars, but inadequate for ZSU-like pulse antennas). - Scan/Lock mode. Currently, it appears to be a combined scan and lock mode. In AA platforms like the Tunguska, it is adequate, but in a ZSU there's only a single dish capable of either scanning or locking. It would be a nice feature to separate scan and fire radar to simulate more complex systems like the S-300, or simple systems like a radar-equipped Vulcan or a ZSU. - A distinction between flashed, locked and missile fired. Similar to the previous note, it allows the pilot to know when you are being pinged by an enemy radar (possibly seen, I can see the enemy radar although I'm not sure if it sees me), locked by it (totally seen, I've been selected as a target by the enemy) and engaged (I'm in weapons range, if I don't attempt evasive maneuvers, I'll be toasted soon). A simple resolution would be a 3-state system pinged/locked/missile fired (instead of the 2-state current one : locked/missile fired). Definitely a must-have for SEAD missions and simulating stealth aircrafts. Although I'm asking for more, I'm totally in love with the stuff you've done so far, keep it up ! How about the idea that a vehicle has a individual radar/ir signature. A Mohawk a big one and the Hummingbird a small one(given in the configs) so that their detection ranges differ. So now comes my idea... how about a Stealth Jet like F117. For the balance only with gbus and no flares. It could only be detected when on close visual range. Powerfull but fragile jet. Second idea: regarding the radar signature. How about making it dynamic. The Blackfoot has a special design for his rocket pods so it has a small signature. As it openeds them it has a bigger one. Had forgotten all about that,that used to be a staple. Man BI, you're really outdoing yourselves first 64 bit exe now this long sought after feature. Enjoy your holidays! That's actually exactly how it works right now. If you select a target at extreme range, it will be Unknown, then Helicopter, then PO-90 Orca. Ideally, you'd be able to identify radar type, not target itself, by the icon. Some radars could be installed on multiple different platforms, so you wouldn't know exactly what are you facing. Indeed, as far as "RWR" goes, a 4th sensor system would be useful - IR missile detection sensors. This is something that is present on many modern aircraft and some tanks. It detects the heat from the plume of the missile and displays a warning. It's in most cases similar to the "illuminated by missile radar" warning, but unlike it, it's a bit less precise, so if you're flying in formation and there's one heading for your wingman, you'll see the warning, too. It also has limited range. I can see the old missile warning system re-purposed to simulate that (just limit its range, make it only show missiles in flight and make it show all missiles fired nearby). EDIT: And another suggestion: ATG and ATA radar modes. The first would only display and track ground targets, the second would only show air targets. For realism, but also for decluttering the radar display when there's a lot going on. Some vehicles could be restricted to a single mode. I know right. The overhaul whores are banging out the changes. Have a well earned Christmas break dynamic sobs. Ill be slightly going against the general grain here. Just hear me rant and whine, let me be your party pooper. I absolutely applaud BI for dedicating themselves to develop a better radar system. I cannot wait to see a working radar / heat seeking technology which will be applicable to a variety of weaponry: naval terrestrial and aerial. But i cannot hide my disappointment in hearing that the next DLC will be about jets. I mean, have you all seen our maps? As big as Altis and Tanoa might be, thats no playground for military jet operations. Take BMS: their theatres are a 100x magnitude bigger: both Koreas, Sinai plus Egypt and Israel, eastern half of Italy and ther whole former Yugoslavia. We are not talking about a 30x30km map, we are talking hundred thousands kmq. And even thought almost every map has seas, and vanilla maps go up to more than a third made of sea, we still dont have any litoral nor expeditionary ship available except for zenith inflatable boats, those submarine thingies and the speedboat minigun. And that's it: no LPDs, no LHDs, no Mk10s, no LCACs, nothing we can use in a beach landing or a seaborne operation. All to have a shark in a fish bowl that will be forced to float around like an air balloon in order not to zip past the map boundaries if he misses his 5G turn opportunity window by a couple of seconds. If a average jet is a F16, its normal cruise speed is mach 1, which means it travels 340km per second. Are we going to get the whole Germany as a map along with the DLC map? Or will they be constrained in a map that is barely long enough as the landing path they usually use? Im just so sorry to come and whine when a very good announcement has come, and again im so happy to hear the news about radars, but jets? Really?